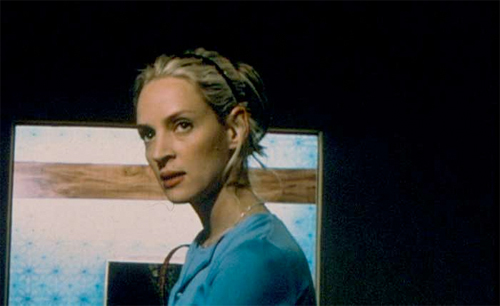 Kimberly Peirce’s Stop-Loss is the perfect example of a film that can show whether you like the medium or the stories. I think I can tell myself that I am a true film fanatic after watching this because I thought it was a great piece of work. I’ve come to this conclusion because while I would see it again and recommend it to friends, I cannot condone one iota of it. It is blatantly anti-war, anti-American, and probably the worst thing that can happen in the US right now. Moral in the war and the troops cannot be helped at all with this very message-driven story. Despite all that, though, I really enjoyed my time with these characters despite how vain and selfish they are. The emotions are real and Peirce shows once again how authentic she can make the South look and feel with a nice rendering of Texas. I really hope we see her next piece with less than a nine-year hiatus as happened here since her debut Boys Don’t Cry. I guess I will get my editorializing out of the way early. People can say that those like our lead Ryan Phillippe are right in disregarding orders when stop-lossed, and I will agree that it is a horrible reality. Unfortunately, though, the main point is the fact that they volunteered to fight and signed a contract stipulating in a time of war they can be held back for another tour. The idea that Bush said the war is over, therefore we aren’t still at war, is the flimsiest piece of bs in the world. I feel for his character that he must go back because he is a good soldier—they keep those they can trust and need to win the fight—but he must follow the orders he swore to listen to when he enlisted. Everything that happens in the film, and I mean everything, occurs due to his selfishness and attempt at a futile mission to change the law. Did he really think he could get a government official to help his cause? Would any Senator risk his job and political stature to harbor the ideals of a fugitive criminal? Come on. Also, with how the story concludes, it was all for naught. Relationships ended, families were torn apart, and friends died all while they were on leave back in America. Phillippe’s character abandoned those that needed him most. His reasoning for not going back to war, that he failed in his job to bring his soldiers home, ended up being his failings once he returned. He left his post for nothing and changed the climate of life in his small Texas town forever. The one flaw with this film is that it is so one-sided in its execution that in order to show him fight for his cause of right, you must also show how his leaving those he cared about left them to die alone with their fears and inability to go back to normal life. Despite all those personal reservations and the fact that this film could damage people’s outlooks on a war they already don’t agree with, as an entry to the world of cinema, it is very effective. I would compare it to The Deer Hunter in its portrayal of wartime clichés without making them feel forced or stereotypical, (not for being even close to the masterpiece that Vietnam movie is, but I could call this an MTV generation’s version). We have the newly weds rejoining after a tour of duty and the hardships that entails, we have the injured soldier banished to a wheelchair and a life of blindness, the soldier so taken out of reality that being a soldier is all he knows, and the entire group suffering from mild to extreme Gulf War Syndrome on full display. Credit Peirce for showing it all realistically and somewhat sympathetically, never wholly to manipulate the audience, but instead to just tell the story she wanted to tell. Her directing style is effective as well, from the handheld look and feel of the alley ambush at the start, the grainy home-film of the troops letting off steam during downtime, to the dark close-ups following the group around back in America. For those intense scenes of violence she deftly cuts in footage from Iraq with what is happening onscreen. The sequence with Phillippe and the thieves who stole Abbie Cornish’s purse is very memorable. Both from the choreography and brutality as well as the reverting back to his Sergeant self, engaging an enemy that is manifested in his mind. Peirce’s only misstep is with the concealing of an event back in Iraq upon Phillippe saving Channing Tatum. To show this scene towards the end of the movie, a scene so out of the blue because it was never alluded to before, was blatant manipulation. She was doing so well at allowing everything to happen on course, until she spliced that harrowing moment to make us hate the war even more. The whole movie could be seen as manipulating the truth, but that instance was the one that made me angry. A big part of my enjoyment, though, is in the fantastic acting by a strong troupe of young thespians. Emotions run high throughout, from extreme happiness to the depths of utter pain and sorrow. The two characters we spend the most time with are Phillippe and Cornish. He is really amazing in his portrayal of the leader in the field and off it. His ability to diffuse the situations cropping up with his friends and soldiers is well played. The slow devolution of his façade that everything is all right is also great. He is the one with his head on straight, but when pushed against a wall, the psyche shows its imperfections. Cornish shows some wonderful moments too, most noticeable when dealing with those they encounter. Her interactions with the disabled at the Veteran Medical facility stick out the most. Speaking of that sequence, kudos to Victor Rasuk as Rico. His outlook on the life he must lead from now on was an interesting thing to see. The juxtaposition of his injuries to the smile and disposition talking with his friend is tough to assimilate. War is most definitely hell, and I liked the lingering shot of him as his two visitors leave the room; his realization and snap back to the reality of being in that bed alone with only his memories of a full life that was there for the taking. 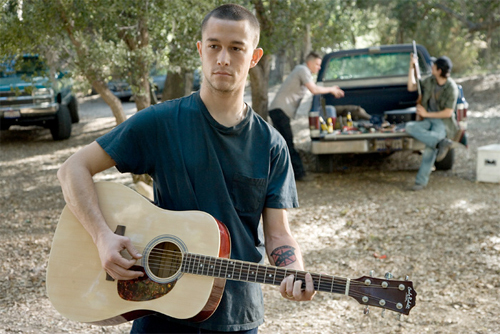 My favorites, however, are Joseph Gordon-Levitt and Tatum. Gordon-Levitt is an obvious choice as the guy is probably the best young actor working today and I am a big fan of his work. He has made a name for himself playing the troubled young adult dealing with inner demons. There is a lot of his character from Manic here as he attempts to reconcile his feelings of relief and happiness to be home with those of hatred and revenge in wanting to go back to the Middle East to cause havoc. Tatum, on the other hand, was a big surprise. I guess when given a role that doesn’t entail dancing or pretending to be an athlete, the guy can bring some talent to the table. As the one who sees a future for himself in the army, unsure whether to pursue it or to stay with the people he promised five years prior, he shows the conflict and inability to be the person he wants to be and the one they want at the same time. All his feelings towards Phillippe for his abandonment are true and I feel the only thing that is at all times real. This character is what kept me from completely writing the film off as anti-war propaganda. He knew his job and saw what fighting the law could do to those close to him. He must watch the world implode while his best friend leaves him to clean up his mess. It’s a turn that I wasn’t quite sure he had in him and maybe will make me buy into some of his hype. I give my experience an A for effort, but a C+ for execution. Sure I only went to one screening, but there was just too much that went astray…hopefully it was a blemish on an otherwise top-notch festival, but if not, at least the workings are there and maybe next year can continue to improve. I understand that The Natural was the big centerpiece and the Buffalo debut of Run Fatboy Run was a close second, but one would hope everything else would get the same kind of respect and attention to detail. There was a decent crowd leaving the Riviera Theatre upon my arrival, so RFR probably had a good showing. As far as the audience for my screening, sparse is being kind. The quality of cinema was fantastic though. Sympathetic Details, stuck in that limbo between feature length and short film, coming in at 57 minutes, was an effective tale containing a great final act and The Cake Eaters was a true indie gem that I loved. It’s heart and quiet realism reminded me of another rural festival circuit winner from a few years ago titled Tully. My gripe is with the handling of the evening. It was day two, so I give some slack, but I literally walked right in, no one asked for my ticket, and I could have sat down with no problem. Only when I finally asked where I should go to have my printout scanned did they have to search the premises for a knowledgeable soul to figure out what I was giving them (I guess I was the first and only person to have preordered my ticket online from the fest’s website). Without introduction, those of us seated in the Riviera (a venue that reminded me of the Elgin in Toronto from my visit to their festival) were treated to the first film. Upon completion, to my utter shock, a man stood up and introduced himself as Benjamin Busch, writer and director of SD and actor from HBO series “The Wire”. The guy came all the way out with his film and thanked us for coming out to support independent cinema. He asked if we had any questions, someone asked one, and as he began to answer the second film began. Yes, it appears no festival workers were in attendance (I could guess this as there was loud talking and bustling from the lobby during both screenings) and they literally didn’t let the filmmaker talk. I felt very sorry for him and would have loved to of heard what he had to say. Busch did stay for TCE and clapped at the end before walking out to the lobby. It was there for the taking if someone would have been paying attention. Instead of volunteers talking outside the theatre (all were gone when we walked out, not even staying until the end) they could have been diligent and allowed an artist, willing to come to our fair city, to have spoken about his work. It’s a shame and hopefully will be something rectified in the future. Mary Stewart Masterson’s film The Cake Eaters is a very well done piece of cinema. A slice of rural life in a sleepy town, we are privy to a period of turmoil and discovery for two families living there. The Kimbrough’s have recently lost their matriarch and a second family is dealing with the hardships of raising a child with Friedriech’s Ataxia. Both groups are thrust together with some chance meetings, helping each other get through the tough times and remember the good in living life. There is a lot of heart on display and subtlety in its portrayal. We see just enough of every story thread to understand the emotions going on inside the heads of all the characters—emotions that are very complicated and co-existing with their exact opposites: can love ever really exist separate from hate? The main catalyst for much of what occurs stems from the return of Guy Kimbrough, back from a three-year, self-imposed exile of rock n’ roll life in NYC. It is an interesting welcome; one mixed with happiness at seeing him and disappointment in the fact that he abandoned them all when they needed him the most. Played by the screenwriter, Jayce Bartok, it is a role that bares similarities to the only other film I have seen him in, Suburbia. There he was a returning rockstar seeing how different he had become when re-connecting with old friends, here he is that same guy, only now with the realization that his dream is over. This is a one-way ticket back home to start over and hope to find what it was he lost in those years away. Needing to make amends with the father and brother he left, the girl he walked out on, and the mother he missed saying goodbye to, Bartok does well showing the sadness and regret along with the hope of rebirth. His introduction back into the life of his brother has a very real effect on the younger Beagle. Played wonderfully by Aaron Stanford, (in a huge departure from his turn as Pyro in the X-Men films), he is reminded of how he had to put his life on hold to care for his parents, one dying and one unable to stay and watch. After meeting the granddaughter of his father’s old friend/flame, he finds that he must start to live for himself. Although she is younger and afflicted with a debilitating muscular disease, the two find a bond and common ground with each other. They see someone like themselves, wanting to find a relationship and person to be with. The climax of their relationship is very strong and well played, allowing the audience to discover whether their connection was strictly of convenience or much more. Kristen Stewart is fantastic as the girl Georgia. The way she must control her body in order for the disease to be real is effective, but also her smile at the hand God dealt her is perfect. This young woman knows her fate and tries to overcome any feelings of sadness by just living. The beauty of The Cake Eaters is that it unfolds very unassumingly, taking its story and its progression as naturally as possible. There are no twists and turns or bombastic moments to hit the audience over the head with. Instead we are allowed a glimpse into the world of this town, where flea markets, butcher shops, and outskirt motels are commonplace and well used. Each moment is completely authentic, from the acting to the relationships uncovered as the film goes on. Even some little moments shine above the rest like when Easy Kimbrough, (the always great Bruce Dern), is telling his girlfriend that he can’t continue their relationship if it remains a secret. He is so heartfelt and she as well trying to keep him for herself in the way she had grown accustomed, but once the phone rings and she finds that her granddaughter has gone off with his son, she turns on him and screams that Beagle isn’t good enough for Georgia. Emotion is a powerful thing and the blunt truth of that scene just rings completely true. With subtle directing and the fearless use of quiet moments to let the actors breathe and do their thing, Masterson has crafted a gem of a film. I kept thinking of another film with similar tonal qualities and settings in Tully while watching. This is strange because I don’t remember much about that film except for really enjoying it, yet somehow I just felt they had a kinship with each other. Definitely an independent feature, I hope it will be able to eventually break the festival circuit and get a proper release either theatrically or on dvd. It is definitely one worth watching for those interested in small character studies and really effective drama. 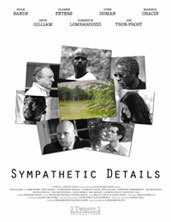 Benjamin Busch’s Sympathetic Details showed here at the Buffalo Niagara Film Festival as the “short” film of a double-header bill with a feature length work. It is tough to call this film a short because its 57 minute runtime puts it on the cusp of being more. I don’t think anyone would ever release a movie under an hour, however, so I guess it becomes a short by default. As is, I think Busch did the right thing in not trying to expand on it to increase the length. Anything more would have been noticeably filler and have screwed up the pacing, which already is a bit odd in the middle. Maybe because it screened from a DVD, but it looked and felt like a true indie, done on the cheap with some friends, yet still reached a higher level of professionalism than would be normally expected from something like that. With all his co-stars from the HBO drama “The Wire” in action, we are treated to a darker rendition of similar themes as those in this year’s black comedy In Bruges. The story concerns a hitman who has grown a conscience and started asking about his target’s survival statistics, the family he will be leaving behind, or as his boss calls it, unnecessary sympathetic details. In this line of work, asking moral questions and then walking away is practically a suicide note as is relayed during the course of the movie. If you are too soft to do the job, you may be too soft to allow others to continue it as well. Any risk of an ex-assassin going informer must be dealt with. Our evolved killer is played by actor Ryan Sands with mixed results. At times he is perfect, but in others he plays it a bit stiff and unnatural. Maybe this was intentional as he was going out of his cold-blooded mentality, but he seemed completely devoid of emotion, a trait that appeared in the script to be what he was discovering. He should have been affected by what happened around him and not just started asking questions while doing his job business as usual. The stoic façade does work perfectly for the final act, though, as he uses his skills to try and save his own life. As for the rest of the cast, we are treated with some solid turns. Clarke Peters is pitch-perfect as the big boss without morals, doing his job because it must be done. His handling of an assistant, at the start, and his conversation with Sands, at the end, are two great scenes. John Doman is effective as Sands’ handler, showing the evolution of feeling that his employee and friend should have had as well. Mixed on whether to do his job as he knows it should be done, (these are bad men with reasons to die, one shouldn’t forget that fact just because they have a family at home), or to protect his colleague because he knows what his future may hold adds a nice layer to the story. There are also nice showings from Marisol Chacin, (a crucial cog to the system that one may overlook), Domenick Lombardozzi, (setting the tone of the film), and Seth Gilliam, (the true nature of how a criminal lives dual lives of deceit and love depending on who he is dealing with). Busch has crafted something here with a lot of potential. There are flaws for sure, but the base is solid. 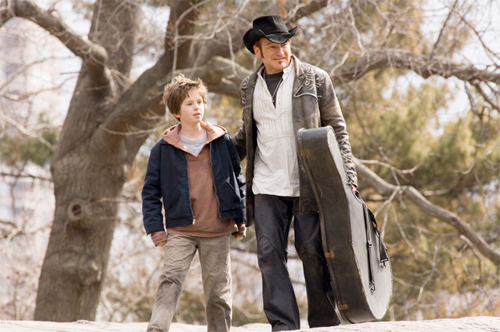 Starting out with a bang—showing an incident and fringe characters, playing with the audience’s notion of investing in people because they are onscreen for a long time without knowing how the story will progress, that really just sets up our introduction to the lead role hidden from view—and concluding with a stellar final act that brings everything full circle, the film is bookmarked perfectly. The middle is the weak link, trying to set up relationships without really needing to. You forget any lulls once the end comes as it all falls into place and everyone’s allegiances are brought to the surface. I give a lot of credit to Busch for ending it as it needed to be. Not quite completely bleak, but definitely not cheery, Sympathetic Details concludes on a note of closure for all involved, bringing each arc to its inevitable finale. Sometimes nostalgia makes a film even better when watching again after a long hiatus. Heck, I didn’t even really view it as I was doing work while it played in the background. The memories I had of So I Married an Axe Murderer allowed me to fill in the blanks and create a seamless experience for when I did look at the tv screen. The script itself is very funny and Mike Myers shows all the potential he had a decade and a half ago. Not to say he didn’t live up to it, but I may say he has never matched the brilliance of this, his first big non-SNL character vehicle. Sure he will always be Austin Powers, but to me, I’ll never forget his beatnik poetry and crazy Scottish family. Myers plays a commitment-phobe who has finally met the woman he believes could be the one to spend the rest of his life with. Unfortunately, his paranoia—and possibly the truth—leads to the discovery that she may be Mrs. X, a serial husband killer at large. The beauty of the movie, though, is that this aspect isn’t the one-joke trick harped on over and over again. Instead we are shown Myers’ family, his police officer friend—Anthony LaPaglia—and his relationship with his police captain (Alan Arkin steals every scene), and the ups and down of dating his new love. It all comes back to the murderous intrigue, but by adding all the other comedic elements to complement, we never get bashed over the head, so when that plot point comes back it never feels stale. It is the characters that truly succeed to make this film hold up over time. Myers is fantastic as a normal guy, not needing to be a caricature like he seems to enjoy being of late with all his alter egos. What we get instead is maybe a representation of him, an unassuming guy with a sense of humor to win over any woman he meets. His delivery is priceless throughout and he even shows he can do some stunts in the action rooftop scenes towards the end. It’s his turn as the father Stuart that is most memorable. Between the horrible Scottish accent, Coke-bottle eyewear, and crass language, you are laughing before he even gets a chance to speak his lines. The rest of the cast is great too. Nancy Travis is the perfect love-interest, playing the dual-life card with enough mystery so that we never quite know if she is really the killer until the ending; Amanda Plummer is crazy and eccentric as always playing her sister; LaPaglia has the dumb cop down-pat; and the who’s who of cameos is great. From Phil Hartman to Steven Wright, to Charles Grodin, everyone does his job. It may not be the best comedy out there, but for some reason, if it’s on tv I always find myself glued to the screen needing to watch, or listen as with today, once more, quoting every funny line before it’s spoken. I don’t think anyone does small, dialogue-heavy indie film like Richard Linklater. He is the master of them and that only makes me madder when he remakes movies like Bad News Bears. Before Sunrise and Before Sunset are beautiful films shot simply and effectively, showing that cinema can rely on words and actors without the need for cranes or effects. 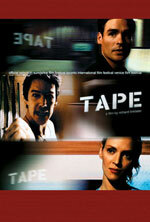 Tape is one that works very well with those as a darker companion. Adapted by Stephen Belber from his own play, Linklater gives us a claustrophobic account of three old friends’ psyches as past pains are dug up to devastating effect. This is one intense film from all angles and very powerful, leading one to remember things they have done it the past that they may regret. But do we ever truly recall them how they actually happened, or just how we have seared the events into our minds? No one can know the real objective truth, just his own subjective outlook. Brought about by one man’s insecurities on why his first girlfriend in high school would not sleep with him, yet as soon as they broke up did so with his best friend, the night starts out light and snowballs into more than he ever could have anticipated. Planning the entire evening in order to entrap his oldest buddy into admitting something that may or may not have happened, not even he could have imagined what emotions would be stirred up getting the two participants into the same room ten years later. Both Vince—the orchestrator—and Jon—the accused—are self-absorbed in a way that they can’t see for themselves. One has not grown up and seems to be in the same rut he has been since graduation while the other has made something of his life, yet it appears somewhat shallowly and not as important as he may want to believe. Always in competition with each other to show how they differ while the other attempts to explain how they are the same, this night is no different. Neither of them has any stake in others and truly is only out to save themselves. Whether we are shown apologies, happiness, truth, or lies, every moment is self-serving, full of empty words spoken to assuage their guilt and not to instill regret or compassion for those they wronged. 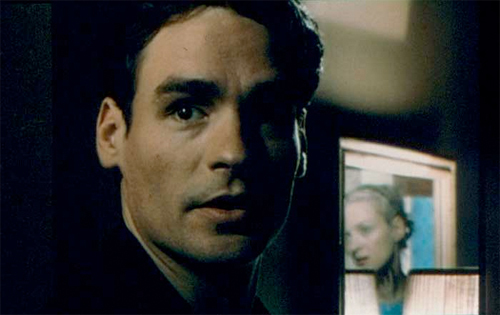 The title of the film is that of the device used as the catalyst for everything. Vince planned it all to perfection in his head, gets buzzed and sets up the motel room as though he was wasted (drink one beer, dump another down the drain, and throw both cans across the room). The room is made so that Jon feels a bit more open to talk, exactly what is wanted as the tape recorder listens to it all. A confession sounds a lot different when uttered than when heard from a tape. What is said in the heat of the moment can be a sobering experience when listened to and can make you think things that may or may not be true. Whether Jon truly did what he eventually confesses to is subject to opinion, and when the “victim” enters into the equation, you can throw all you thought was true out the window. Did she see the incident in the same way? Did she know exactly what she was doing? Only they know for certain, but the mind is a fickle machine, evolving over time, changing events to mirror the memory instead of the reality. One man’s moral crusade, his attempt at gaining closure for himself while possibly also for his friends, finds that his selfishness not only could destroy the one relationship he truly relies on, but also the lives of the three involved. With an intense script to begin with, it all becomes more so from the setting and film style. Trapped in a small room for the duration, the stakes rise higher and higher as we are shown a slowly uncovering past. The camera begins to film more close-ups and we never get to go outside the door nor into the bathroom—the room gets smaller and smaller until it is stifling with the addition of our last character. A big part also is the real life relationships between those involved. The three actors, as well as the director, have a bond that allows them to be as real as possible onscreen, making it all believable. You have Ethan Hawke as Vince, his real-life wife at the time Uma Thurman as Amy, and I’m assuming friend Robert Sean Leonard (I guess this because he does so little work and co-starred with Hawke in Dead Poets Society that maybe he joined the cast as a favor to his friend), and close collaborator Linklater, whom Hawke has worked with extensively. Each is phenomenal in their execution and once the climax comes to a boil you finally see the true self of all. Maybe the victim is actually the strongest and maybe the self-righteous accuser is the weak link to the group, always running and always hiding. It is really up to the viewer to decide what is true and what isn’t. Just because a confession is on tape does not mean it is truth. That is in the eye of the beholder. Do not let the Hollywood marketing machine fool you. Yes Simon Pegg stars in Run Fatboy Run and yes he has cowriter credit on it, however, this is not a Pegg/Wright/Park production like Hot Fuzz, Shaun of the Dead, and “Spaced.” No this is a story from the warped mind of Michael Ian Black, he of “The State” fame. It appears from the “story by” credit to Black that maybe Pegg came in late with some tweaks and rewrites after he was cast. There is a bit of him on display—some British humor and the use of cyclical stunts to add some funny as an incident harkens back to earlier in the film—at the end, though, this is a different kind of comedy. While I won’t go as far as some reviews I’ve read that being a fan of Fuzz and Shaun means you will hate this, I can see where they are coming from. Not quite complete physical humor nor subtle rhetoric; this falls in a niche of most generic comedies coming down the pipeline. It has some fantastic parts, though, and I am a fan of Black’s work, so I will admit to having a smile for most of the duration. As long as you don’t expect genius, (or a cameo from Nick Frost), you should still have a fun time despite your comedic predilections. The synopsis is that a common Joe, with low self-esteem, let the love of his life go due to a fit of nerves and self-loathing. Five years later and his life is at an all-time low, getting his son arrested, watching a successful American make the moves with his ex, having money problems, and just going through the motions of a life he has resigned himself to living. With all odds against him, Dennis, (Pegg), signs up for a Nike marathon to show that he’s not a quitter. Don’t let that tried and true gimmick to win back his love fool you; the race is actually a somewhat small part of the whole and serves as a springboard for more situations in which he can get into trouble with during training. I’ll admit that the broad comedy got old and was way too obvious, making me yearn for the humor I know Pegg is used to delivering, but I kept reminding myself that “Friend” Ross Gellar himself had the reins, so I took it for what it was. Sometimes a little crassness can be fun when used sparingly. I would say that the film had heart, but those moments are too sentimental to really praise. The music has a tendency to swell and the script starts to pull at the heart-strings before fading back as a new joke emerges. If handled a bit more deftly this could have been a much better film because the makings are definitely there. Story threads like that of the son and his first crush during the time his mother is dating a new man are glossed over too easily, used for dramatic emphasis in the life of our lead rather than a way to flesh out the characters around him. With so many supporting roles, I wish we’d have been given more of a complete story instead of using them as props to have Pegg bounce off of. That said, the other actors are really good with the one-way story arcs they are given. I have always been a Hank Azaria fan. The guy is so likeable that he can play the jerk to perfection. I felt bad for him at times being reduced to acting some of the situations scripted, (the lazily written locker room scene comes to mind), but he is perfect for the role, laying some sharp jabs at the right time and always being genuinely happy to see someone willing to go through a marathon, an obsession of his own, while inwardly laughing at the absurdity of Pegg finishing it. Thandie Newton does well as the woman caught between these two men. With not much to really do, she is still effective in showing the emotional back and forth happening. We also get Harish Patel as Pegg’s Indian landlord and friend, but the role comes off too much as a caricature to really praise, other then a good word for the man playing it. 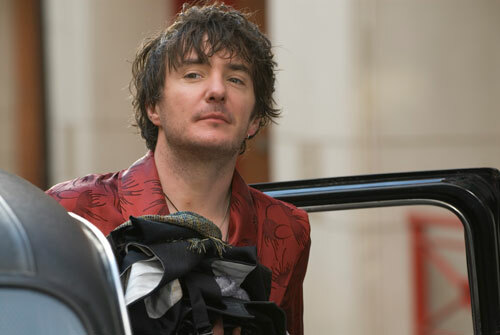 The saving grace to everything, though, is Dylan Moran. Maybe it is because I have begun to watch his fantastic British series “Black Books,” but he warrants a laugh each time he is onscreen. From his relationship with Newton (cousin) and Pegg (best friend), to his gambling lifestyle, to his self-hiring as fitness coach, Moran is absolutely priceless. 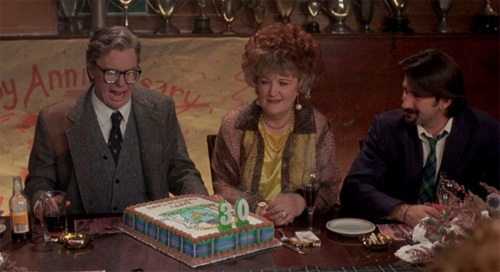 His dialogue and actions at his cousin’s birthday party are worth seeing the movie by itself. 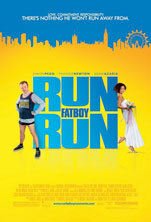 Run Fatboy Run ends up being more for the Farrelly Brothers crowd than the British humor ones. That may actually hurt it being that so many Americans hate English accents and find them hard to understand. Hopefully it will find its audience, though, because despite its watered-down execution, any way to get UK faces like Pegg and Moran some time in the Hollywood limelight is a good thing. I just wish they’d market it for what it is, a comedy by David Schwimmer, not a new masterpiece from the people that brought us a couple of modern-day classics. It’s funny and it’s entertaining for an evening out, but it’s not necessarily something I’d seek out to see again…well except the race at the end, some real good stuff does go on there. 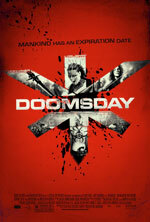 Forget all the subtle and nuance of mood from Neil Marshall’s taut thriller The Descent; he decided to go all out with the new flick Doomsday. Call it 28 Weeks Beyond Thunderdome if you’d like as Marshall seems to cull all the best aspects of past cinema B-movie greats to create a pastiche that is one helluva ride. With a plot that serves only to give us an excuse for action and borderline comical characters introducing us to the punk-metal cannibal way of life as well as a separate sect going back to medieval times complete with king and executioner, you’ll be wrestling with the urge to cheer, laugh, or cover your face without knowing which one to do. Check your brain at the door and buckle in for a good time with blood, cars, and fire galore. After an infection of the Reaper virus was discovered in Scotland, the entire half of the island was quarantined and left for dead. Only when the outbreak appears to be resurfacing some thirty years later in London and a new containment strategy is underway does the government decide to go back in search of a cure. Finding that there have been survivors up north behind the wall, it is assumed that there must be a cure to bring back and save humanity. If it were that easy, though, we wouldn’t have half as much fun as we do. You see the one man that might have been able to invent the end of the disease, Kane, is not as sane as he might have been. Thirty years of being left behind has pushed any idealism from his head, deciding instead to use his immunity as the power to rule. Telling his people that they are the survivors of the virus and the outside has been destroyed, he is able to keep a short leash while he stays in his castle lording over them. His son Sol doesn’t buy into it and takes a section with him to the cities, waiting for a rescue party that they can capture and use as a way out. Drop in some military and scientific personnel—to find Kane—smack dab in the middle of a war and the party begins. With a high bodycount and a complete lack of the necessity to show every character until their end, (Kane, played maliciously by Malcolm McDowell is a complete MacGuffin with little screentime and more mythical stature than actual man of any consequence), Doomsday leads us through a wasteland of carnage where the idea of a cure really falls away behind the desire to see if Major Eden Sinclair can kill more people and stay alive herself. It is too much to worry about a world about to be obliterated by a tiny microorganism when we have a woman’s life at stake right before our eyes. You soon forget her mission and start putting all your interest behind her crazy carefree attitude taken with any adversary. The Major is portrayed by Rhona Mitra, an actress I have heard and seen very little of, although it appears she is on her way to becoming a household name among the internet film community. I tell you what, consider me won over. From the badass demeanor, the gladiator style beat-down, the high-speed driving prowess, an utter fearlessness, and not to forget a camera for an eye, Mitra takes this role and flies high with it, never looking back at reality. When you have this type of off-the-wall intrigue, you need to have some serious people to counterbalance the wackiness. We get the puppet Prime Minister from a favorite of mine Alexander Siddig along with the man who pulls his strings played by a raspy voiced David O’Hara. These two are included to try and give us some semblance of real world stakes while the circus continues on in the zoo that was Scotland. Even Mitra’s handler is played straight by the always-great Bob Hoskins. They all help ground the film so that we can have our fun with characters like the city dwellers’ leader Sol. In complete crazed manic wildness, Craig Conway steals the show. Between the mohawk, the face tattooed girlfriend with a tongue to rival KISS, a penchant for loud screams, and the dance moves to metal, this guy is one-of-a-kind. His crew pitted against Mitra’s is a sight to behold. Through all the fights, stunts, and pyrotechnics, one sequence stands out above the rest. In what could be the most exhilarating car chase I have ever seen, Marshall treats us to some fantastic footage. He must have had cameras everywhere to film it all because I don’t see them doing multiple takes. Why try to take a car out when you can jump through the front windows and battle with the driver at 100 mph? Watching a fast-paced car race with two guys hanging halfway inside the car, a gun changing hands, and elbows flying wildly is just fantastic. A bigger budget has allowed Marshall to spread his wings a bit and create an amalgam so familiar that it becomes uniquely original. I may not have learned anything nor found any emotive connection with the plight to save humanity, but I definitely left the theatre with a huge smile on my face. Rhona Mitra as Eden Sinclair in Rogue Pictures’ Doomsday (2008) Copyright © Rogue Pictures. All Rights Reserved. Copyright © Rogue Pictures. All Rights Reserved. This film had great potential when I saw the trailer, but I never really thought it could ever live up to it. I saw it falling into the Hollywood pitfalls of convenience and laziness, making everything overly sentimental and dripping with saccharine. Now, there’s a fair share of those moments, yet I never minded one bit because the heart was always at the forefront. Being so instilled with an otherworldly quality and fairytale mystic, nothing seems out of place. One needs those moments of coincidence and chance bringing paths together along the way. Sure it happens in real life, but in the stories told to us as children it occurs all the time. We as kids need those common tomes and roads intertwining in order to wrap our minds around the cause of all the inevitable happiness. Fate brings good things together in these types of tales and for that reason each moment rings absolutely true—that is if you let the story take you over and buy into its magic. Sheridan orchestrates the visual music to perfection. 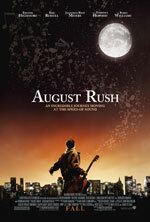 When our star, Evan Taylor/August Rush, played by Freddie Highmore, hears the world around him making their songs, it is stunning to behold. The quick cuts from shoes on the street, basketballs on the chain netting, steam emitted from smokestacks, etc, bring each symphony into reality. Even those moments when he sets his eyes on an instrument for the first time, intuitively knowing how to play it, make you believe his pure joy in the act and his genius in order to play what he does. Highmore is quite the talent and I’m not sure how to take what I have heard recently about him saying he will quit acting once he grows up. For one I have all the respect in the world for that decision, stop with the success now and make a life for yourself instead of fighting through the pressure and criticisms of never being as good older as you were in the past. However, I can’t help but think he may have some greatness left in him that we may never be able to experience. As for the tale itself, we are treated with the union of two musicians lost on their way to adulthood. A rockstar unsure of the life he is being asked to live and a Julliard trained cellist attempting to reconcile her love for the craft with the hatred of her father forcing her into it. Their love brings forth a child that they will never know, yet who will never give up in the search to find them. With music as the canvas connecting them all together, they journey out of the safe lives they have lived, following the music eleven years later in order to see if the happiness they once knew could still be out there for the taking. It really is a gorgeous tale of love and hope, sprinkled with some visual panache and the unabashed confidence to let songs, both lyrical and instrumental, bolster the proceedings into a concert of vibrancy. Keri Russell and Jonathan Rhys Meyers both are wonderful as the torn lovers finding themselves and eventually the desire to find each other again. I was very surprised to see that Rhys Meyers actually sang his own songs being that the lip-synching was so horrible, but I don’t want that to hamper my viewing of the use of music here. Every performance is believable and well done. Even the guitar slapping, something I have never seen before, is quite mesmerizing to behold. Terrence Howard brings a nice role to the story as well, playing the social worker trying to work as a liaison between all parties, always with the best interests of the child in mind. And of course there is Robin Williams. His role is a far cry from the one that is fleshed out in the trailer. While he does what he can to help the boy, his motives are not as wholesome as you may expect in the beginning. Attempting to live out the fantasy of success he must have always had in life, he begins to put the boy’s best interests into the backseat. It leads to some powerful moments and he does a great job with the tough role. Through it all, though, everything that happens leads into the climax of the film. What a scene that is too. Starting with the concerts of both Russell and Rhys Meyers, on different sides of NYC, and Highmore underground awaiting his next move while his debut begins above him, we are led full circle through all the relationships that have been brought forth. Every character finally becomes that which they have been workings towards—mention should be made for Leon G. Thomas III as Arthur with some fantastic work. Yes, the conclusion is obvious, but it is also the perfect ending to the story. There are no epilogues or embraces of happiness, instead we get what we deserve, a final instance of music bringing the world together and helping lovers find their way. Writer/Director James Gray has made three films with six or seven years in between each. His newest is the cop drama We Own the Night, a pretty basic tale of brothers on different sides of the law and a crime that brings them together. Truthfully, it is very straightforward, clichéd, and quite convenient at many turns. One must give credit to the cast for doing all they can to mask the banality of it all as they do make it interesting to follow through. One can’t help but feel cheated, though, when all is said and done. There are a lot of good things happening, unfortunately it is all so obvious that it doesn’t really matter. Every twist and turn is telestrated. While this means there’s few plot holes it also means there are few surprises. Clues and devices are laid out in the open for us to realize that events occur for a reason, but have a little tact, please. (They give him a Zippo and he doesn’t think anything of using his matches still? At least let him put both in his pocket and not show him light another cigarette; don’t make him look like an idiot by continuously using the matchbook.) Relationships are altered very quickly and easily, but I guess one can believe the major tragedies happening will do that. Maybe the bad blood between father and son vs. black sheep was fleshed out too well making the reversal that much more difficult to buy. The pieces all fall because that is the only place they can in order for the film to conclude in the way the filmmaker imagined. It is all a puzzle with a beginning and end that was filled up with too much detail in order to make it all interlock perfectly. While the plot and execution are stale and ordinary, the performances are not. If Gray did anything top-notch it was in his ability to squeeze some great turns from his actors. 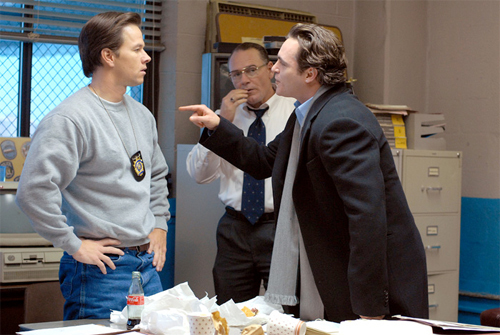 Even Mark Wahlberg, great in the right roles and atrocious in the wrong ones, does well as a by-the-books cop. Maybe because he is not onscreen for very long, I thought he did a good job holding his own against better talent and never falls into his overacting schtick, (whether this gives me hope that he won’t ruin Shyamalan’s new movie as a public school science teacher remains to be seen). Eva Mendes also does well, giving her female in distress stereotyped role some emotion and breathing room, allowing the audience to see that she is more than the Puerto Rican bimbo her boyfriend’s family thinks she is. And then you have the legend Robert Duvall playing another rendition of what he does best—the hard-nosed taskmaster with the stone façade and maybe a little bit of heart buried underneath. His transformation in regards to how he treats his sons is the most unbelievable of all, but for some reason he pulls it off well enough for me to not care as much. The real star of the show, however, is Joaquin Phoenix. I have heard some things saying that he is pretty bad here, but I beg to differ. If anyone’s metamorphosis is to be realistic, it is his Bobby Green. Here is a man that decided to go on his own path to success, turning down the law enforcement life of his family and becoming a free spirit who works his way from bartender to club manager. Between the fast lifestyle, drugs, and money you forgive his naivete to what is going on behind the scenes. To experience the atrocities that soon turn his world upside down would change anyone’s outlook on life. Wanting to make amends for things that were out of his control, yet tugging away at his psyche with immense guilt, Phoenix starts to show the qualities that make him like his father and brother. Just because he did the drugs and partied hard never meant he didn’t have a good sense of moral fortitude and compassion for his fellow man. Some people just need a push to let it all come to the surface. Complete with a cornucopia of supporting roles including nice turns from Danny Hoch as Jumbo, Alex Veadov as Vadim (quite the intimidating cat), and Moni Moshonov as Buzhayev, Gray has a knack for allowing his pieces to find their voices and work the board. It is a shame that they couldn’t have been doing it all for a better film. We Own the Night is not bad by any means; it just is nothing special either. In a time when mainstream dramas are a dime a dozen, films need to have that little extra something to set them apart from the rest. This one hopes that it can mix a couple genres together, make it all air tight, and set it free to become great. Things just don’t work that way. I myself would rather have a plot hole ridden work of uniquely inventive art than a steady, safe story that can be deciphered right from the opening credits.